The last time I visited Seattle I was a rising senior in college. That summer, I spent a few days with my friend Miller, who was from the inland suburb of Issaquah. Thereafter, I went down to Portland to visit another college friend, Newland. That was the last time I was in Portland too. In the decade and a half since, both cities have become exciting and alluring hubs of restaurant activity. But unlike Portland, Seattle has also become home to nearly a dozen friends from high school, college, and law school. So, last year, when I found a window in my travel schedule, I finally made it back to the Pacific Northwest to revisit, to reunite, and to eat. What I found in and around the city was so beautiful, and much of it so delicious, that I went back a second time before the year was over. There’s very little that doesn’t appeal to me about Seattle. The traffic situation can be a little scary at times, and there’s always the looming threat that the Pacific Rim will do a tectonic jig. But otherwise, the city is ideal. Seattle is home to a large port, and lots of tech-driven enterprises, which attracts a well-educated and intelligent population (the two, I have learned, don’t necessarily go hand-in-hand). Probably for the same reasons, the city falls on the more progressive, more liberal side of the political spectrum (admittedly, certain aspects of the local liberalism seemed a bit too far to the left for my Midwestern conservatism), and has become home to a rather international demographic, with a high number of Asian and European immigrants and second or third-generation residents, whose culture is reflected in the city’s open personality. 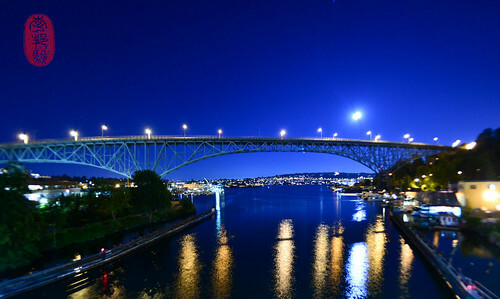 Spread across a jigsaw of evergreen islands and peninsulas stitched together with bridges, Seattle boasts a unique, and particularly beautiful urban setting. Some complain that the weather in the area is too wet and gloomy, and perpetually too cool. I, on the other hand, celebrate it. Its brisk air and oft-overcast skies suit me well. Due to the abundance of nature surrounding them, Seattleites are incredibly outdoorsy. And, perhaps it’s because of this proximity to nature, and their appreciation for it, that people in Seattle are refreshingly practical too. I love that. It also means that they have easy access to incredibly ingredients, especially seafood. Seattle pragmatism is apparent in the way the city likes to eat. 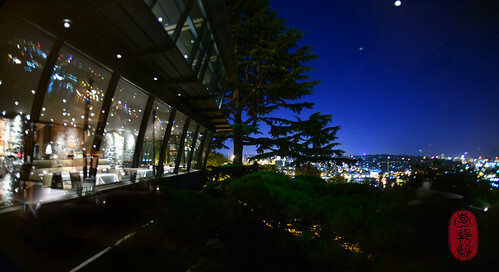 Other than the storied Canlis, which has been a fixture atop Seattle’s dining scene for the past six decades, most of what locals consider “fine dining” in Seattle is rather casual by American standards. Here, the fineness of dining focuses more on the products than on the trappings. Take, for example, chef Matt Dillon‘s restaurants. I visited three of them (his family of restaurants is extensive), none of which I would consider to be “fancy” or “fine” (in the traditional sense of those words) for its looks. But, I fell in love with all of them nonetheless. I had lunch at Sitka & Spruce twice. Located in an L-shaped, back-corner space of an indoor food hall (where you’ll find a butcher, a baker, and a barrista), the restaurant is a mix of kitchen space and communal, counter, and small-group seating. On both visits, the service was a hair smug, a streak too hipsterish, and a bit too casual even for me. But Seattleites don’t seem to mind helping themselves – when one of the diners sitting at the counter, facing a wall of windows, needed a bit of fresh air, he used a small log to prop open the window. But the food was terrific. The style and simplicity of Dillon’s food very much reminded me of Amaryll Schwertner’s approach to cooking at Boulette’s Larder in San Francisco. The plates at Sitka & Spruce were clean and neat, and everything on them pristine and perfect. 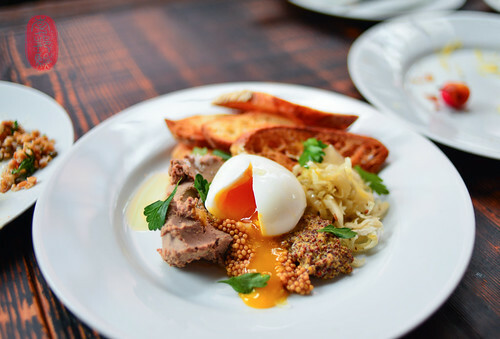 I had a beautifully cooked grain salad on a creamy bed of yogurt; slices of beautiful, local salmon cured with fir; dark, fleshy green salads; wonderful, local cheeses with house-made crackers; and hearty spoonfuls of chicken liver pâté topped with a perfectly cooked soft egg. I don’t mean to suggest that Dillon’s restaurants aren’t comfortable, or aren’t otherwise charming. To the contrary, they’re immensely so, each full of personality and expressive of place. Whereas Sitka & Spruce is very much the Seattle urbanite, smart and smug, The Corson Building brings a touch of Old World romanticism to the bohemian neighborhood of Georgetown. This old, stone structure, surrounded by a lovely garden, is only open to the public three nights a week, and the menu format varies from night to night (à la carte or prix fixe, depending on the night). Small and cozy, the dining room, which feels a touch medieval in its spartan simplicity, offers a communal dining experience [although, the night I went (with a seven others), the room seemed dominated by large parties that were easily separated by sectioning the long tables]. The food was served family-style, on large plates. Sometimes, the portioning was inexact, which prompted our server to encourage us to ask for more food if we needed it. Service here was warm, and like the food, familial. The dish I liked most had thick slices of quince-glazed ham served with lentils and black trumpet mushrooms. It was the sort of hearty, comforting fare that made sense in its setting. Go with a large group, you’ll have more fun. 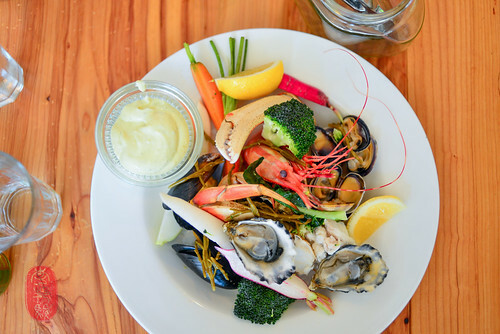 I only had a short lunch at Bar Sajor, just enough to revel in the magic of the space and enjoy a few light salads of fresh seafood and vegetables with a couple of friends. I’ll have to return for a fuller experience. When I do, I’ll focus on the food that comes out of the wood-fired oven that I saw Dillon tending. 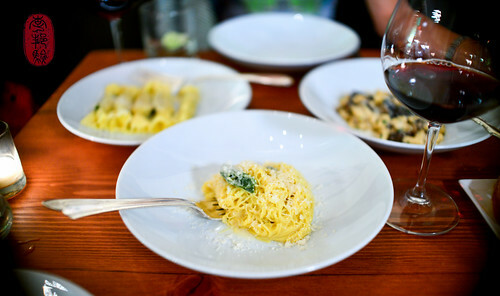 On the city’s Capitol Hill neighborhood, I indulged in a buttery tangle of tajarin at Jason Stratton‘s Cascina Spinasse. All the pastas I had there – a restaurant based on the cooking of the Piedmonte region of Italy – were good. But the tajarin was especially so. 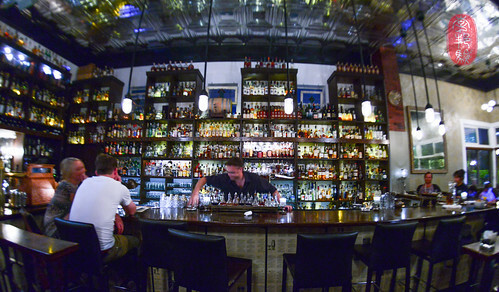 In the city’s Madison neighborhood, I went to Jason Wilson‘s Crush. Some of the food there was truly delicious, like a 48-hour braised zabuton (Japanese for “cushion,” it accurately describes how soft this cut of wagyu short rib was), or a scattered-looking, but ultimately satisfying plate of sweetbreads, with mustard and suet-cooked potatoes. But some of it left me scratching my head, like a strange “risotto” made of finely milled octopus that was mealy in texture and hidden under a frothy green dome along with green tomato jam. Or a squid ink macaron piped with goat cheese that arrived under a cloche of smoke so strong in flavor that it obscured what otherwise might have been a tasty bite. I really liked what little I saw of Seattle’s Ballard neighborhood. I visited two restaurants there, one in front of the other. Standing on Ballard Avenue, you’ll see Ethan Stowell‘s Staple & Fancy Mercantile in a beautifully restored turn-of-the-last century brick building (once a marine supply store, the Kolstrand Building was also a staple and fancy mercantile, hence the restaurant’s name). Very much like the neighborhood that surrounds it, the interior applies a stylish layer of revivalism on top of its rougher, industrial past. If you peer through the “looking glass” windows at the back of Staple & Fancy Mercantile, you’ll get an eyeful of its neighbor, The Walrus & The Carpenter, which occupies the adjacent space (the restaurant’s front door is next to Staple & Fancy Mercantile on Ballard Avenue – it takes you down a long hallway that brings you behind Staple & Fancy Mercantile). The Walrus and the Carpenter (named after the two characters in Lewis Carroll’s poem in his famous book Through The Looking Glass , who ate their oyster companions) is billed as an oyster bar. Although I would argue that it’s much more than just an oyster bar, I did have a very fine plate of fried ones (cornmeal-breaded) there. Because it is so small, because the food there is so fresh, so clean, and so thoughtfully-made, because it has enjoyed a significant amount of local and national acclaim, and mostly because they do not take reservations, you will almost always have to wait – sometimes at great length – to eat at The Walrus and Carpenter. The night I went, I got lucky and saddled up to a lone counter seat outside on the patio. Besides those fried oysters, I had a terrific shaved salad of fennel and apricots dressed in buttermilk, all of it crowned with spicy ribbons of shaved chorizo. I also had a delicate fillet of smoked trout sitting atop a creamy bed of lentils and chopped walnuts bound in crème fraîche, its richness halved by pickled red onions. I already wrote about À La Mode Pies in Seattle’s Phinney neighborhood in a previous post. But I don’t think I mentioned Bakery Nouveau in West Seattle, where I found some very good vienoisserie – like a creatively constructed strawberry-pistachio “croissant,” and a beautiful pear danish framed in puff pastry. 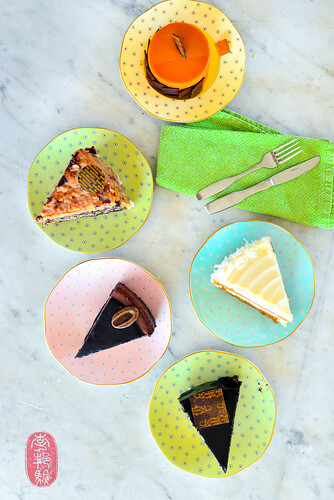 I also sampled quite a few of Bakery Nouveau’s cakes. My favorite, by far, was the “classic chocolate cake. And, despite being a bit dense, and bit too choked with frosting, the carrot cake was pretty good too. Eric Rivera, who now works behind the scenes for Grant Achatz’s family of restaurants in Chicago but who used to work in Seattle, urged me to swing by Fuji Bakery in Seattle’s Chinatown neighborhood. There, I found a case full of creative Euro-Asian mash-ups, like a “croissant” swirled with matcha tea, and brioche buns filled with red bean paste. There were also brioche cubes filled with salmon (which I’ll have to go back and try), beautiful brioche-like buns filled with custard, and loaves of panettone. The production levels seemed so high that I’m not sure I would call this an artisanal enterprise, and the quality of craftsmanship isn’t as high as it could be, but, if you’re in the area, it’s worth a visit (there are two other locations: one in Queen Anne, the other in Bellevue). Perched above Queen Anne (a neighborhood), with a gorgeous view of both land and water, Canlis is elegant, and in many ways, timeless. The structure, built in the 1950’s, is a beautiful statement of mid-century modern simplicity, with a long, linear look and a panoramic wall of windows that draws your attention outward. I found Canlis near the end of a revolution when I arrived last summer. With sixty years of history and customers behind it, the restaurant, now run by the two Canlis brothers, who have taken over the restaurant from their forebears, looks forward to a new era. They brought in Jason Franey, a young chef who had worked under Daniel Humm at Campton Place in San Francisco and at Eleven Madison Park in New York City (although I had eaten at Eleven Madison Park many times when Franey was the executive sous chef there, I first met him at the Twelve Days of Christmas at The Restaurant at Meadowood at the end of 2012). But the revolution is incomplete. There are still remnants of Canlis’s past on the menu: you can still order the patriarch Peter Canlis’s salad, and his famous prawns; both are favorites among the restaurant’s long-tending regulars. Sautéed in a buttery mix of vermouth and garlic, with a splash of lime, the flavors of the prawn dish are classic, familiar, and unimpeachable. Franey has revised the dish, slightly, with a more modern plating style. But regardless of its form, it’s a dish that needs no apologies from either the past or the present. I had an absolutely lovely night in the restaurant’s lounge with those prawns, a soufflé, and a pianist (who took my oddball requests with flare). It could have been 1960, or 2013; I didn’t care. There are some revolutions not worth completing, some traditions better left intact. Call me sentimental, but I think this is one of them. But if you will let Franey tell his story, you’ll find a new chapter unfolding at Canlis. His tasting menu is a colorful procession of smaller portions showcasing a more contemporary study of flavors (and, if you ate at Eleven Madison Park in the first few years Humm was there, you’ll recognize a similar style of plating at Canlis). The one I remember most was a small glass of yogurt with various pickled vegetables and fruits – a verrine of the fermented. I had two spectacular meals at Willows Inn on Lummi Island. But there’s too much to say about them to include them here. So I will devote a separate post to telling those stories. For now, I leave you with a list of restaurants in the Seattle area that I visited in 2013. Each is linked to an album of the photos that I took at those meals. Photos: Sunset from Lummi Island, Washington; bridge at night, Seattle; chicken liver pâté and a soft boiled egg at Sitka & Spruce; the fireplace at The Corson Building; the “grand aioli” seafood platter at Bar Sajor; the tajarin at Cascina Spinasse; the interior of Staple & Fancy Mercantile; cakes from Bakery Nouveau; the view from Canlis at night; and the bar at Canon. 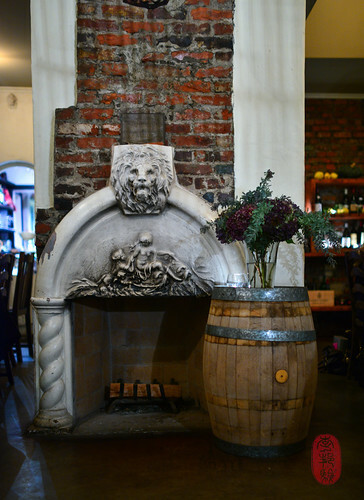 ~ by ulterior epicure on January 18, 2014.
i agree that Sitka & Boulette’s are sister restaurants – from the food to the setting to the laissez faire attitude about it all. i really enjoyed it & would frequent if i lived there. Did you stay at Lummi Island. Would love to go to the restaurant but it is such a trek. Ha ha! The pot macaron at Crush!! I can’t believe that was still on the menu (we experienced it in September, I believe). No one in our section of the restaurant could figure that one out. It was like eating a half-smoked cigar. Sitka and Spruce has been our favorite for many years. Glad to see you found it equally enjoyable.